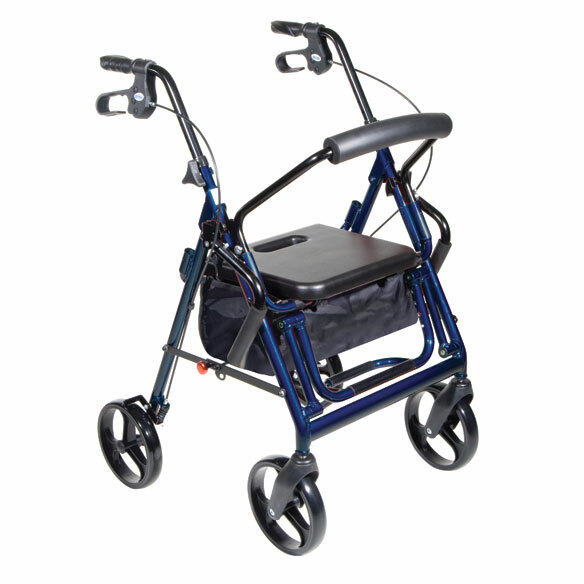 Padded backrest on this tranport chair and rollator locks forward to switch between the two; instant safety-lock operation features fold-down, height-adjustable footrest and flip-down armrests. Large under-seat pouch. Sturdy 8" casters designed for indoors and outdoors. Made of durable aluminum and ABS plastic. Wipe clean. Supports 300 lbs. Handle height adjusts from 32"-38" H. Measures 24" W x 25" D; seat is 13 1/2" W x 13" D. Seat-to-floor height is 21" H. Folds to 19" D. Weighs 21 lbs. No express shipping. It's much heavier than other rollators we've had and more cumbersome. In order to fit it in our car, we have to remove the back bar and handle bars. I use this walker day and night because of my severe arthritis and weakness. It is easy to maneuver in my small duplex, or on the grass when I go to sport events. I use the seat for placing things on when I move from room to room. I would not be mobile without this device. I highly recommend it. I am 76 and a retired RN and live by myself. The brakes are wonderful and it turns on a dime. Brakes when used as rolling walker and foot rest for when used as transport chair with assistant pushing the cart. My mom is 96 yo. and experience some weakness in her legs sometime. this will assist in her mobility. Convenient for my mother. She will have the option to walk or be pushed without changing from a walker to wheelchair. This is also going to be easier for her when she travels. This will be a good vehicle for my 96 year old sister for whom I am personal caregiver. CAN'T WALK WELL SO WHEN I GET TIRED I GET PUSHED, FEELS GREAT. I like your products and the efficiency of the way merchandise is sent. This product seems to have the most convenient and applicable design features of the many other products I viewed. Because my wife needs it. It would be convenient for my 92 year old father who is able to walk. He is recovering from surgery and gets short of breath. So, he needs the rollator for assistance while he is recuperating. The transport chair will cut down on so much walking when going for appointments and shopping. My husband and I need a second walker and since sometimes one or the other of us feels a little dizzy we decided this walker would give us a choice if we need a wheelchair. Because it does both transport and walker. My husband uses a wheelchair, but needs a second chair sometimes. Because it works two ways as walker and wheelchair and using only one piece of equipment that is handy at all times. I know it will be great and very useful. Having hip surgery; need reasonable mobility product. Often my relative gets winded when walking. The option to change to a transport positon is preferred. My 88 year old mother is very independent, but occasionally when shopping needs options! Looks sturdy and my husband wanted the transport chair for when his legs were to weak to use the walker. We need to replace a wheelchair and a walker, and this will give us more space in our retirement apartment. So I can start walking without fear of not finding a place to sit safely. For my sister, she has several autoimmune diseases. I already use a walker but often need a cart or wheelchair. This should provide both. It helps me walk easier and when my kids want me to go somewhere that there is a lot of walking it converts to wheel chair! I have a regular walker but the brakes are getting worn. 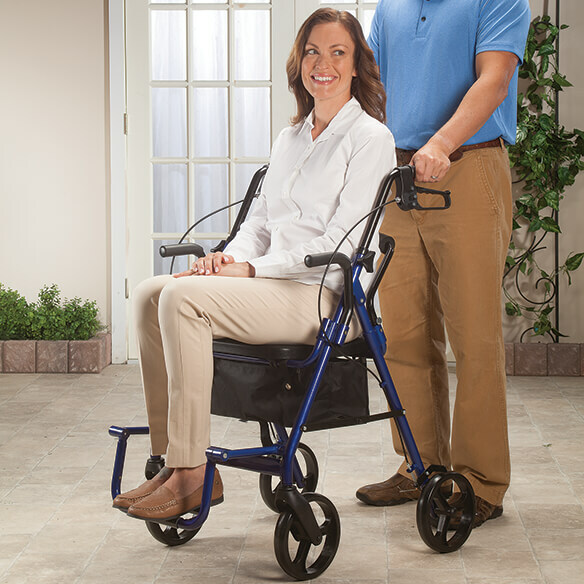 While looking on Easy Comfort web site I noticed that the walker I ordered also converted into a transfer chair easily. This means that I will be able to become more active and go to more places. I can just sit and be pushed with foot supports and handles behind me whenever I get tired. This will greatly improve my life. I often carry a transport chair and rollator walker for my mom in case she tires from walking and needs the chair. This sounds like a better alternative. BEST ANSWER: Thank you for your question. Thank you for your question. Unfortunately, we are contractually obligated not to provide any manufacture information including brand name. As far as separate footrests compared to the joint footrest this is something that is determined by the individual user. Some people prefer joint while other prefer separate. Please note, this footrest can be folded to be out of the way. We hope this information will be of help to you. transportchair and rollator I 1 has all features that would make mobility complete except1 thing "A BASKET ATTACHMENT" is there a basket attachment ? BEST ANSWER: Thank you for your question. There is not a basket attachment that we carry. We hope this information will be of help to you. i need to know the distance between the handles? BEST ANSWER: Thank you for your question. The distance between the handles are 20 inches. We hope this information will be of help to you. BEST ANSWER: Thank you for your question. 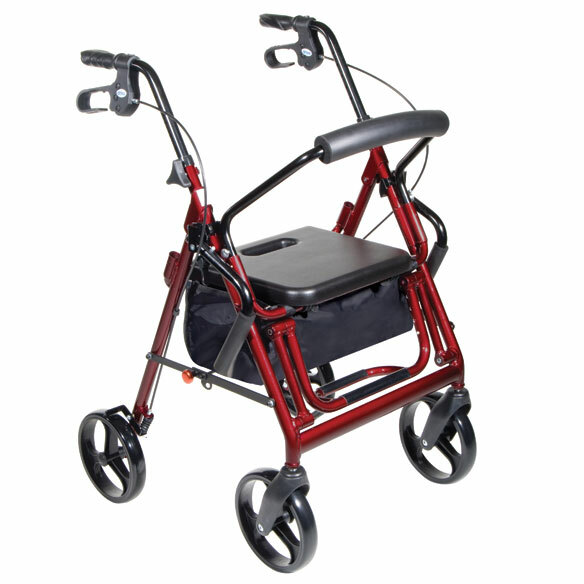 We do offer different style walkers with different sized seats. We suggest checking our website for a model that you like and then seeing if the seat size would meet you needs. We hope this information will be of help to you. Can you be pushed in this one? BEST ANSWER: I am 77 years old and love this chair. My husband and family take turns pushing me when I get tired. this chair I can walk as long as I want to and then be pushed. Yes, I push my mother-in-law around the house in this walker. It is very easy and less bulky than a wheelchair. However, it would not be good for a long distance. For doctor, hair and other appointments I use a wheelchair. Yes you can be pushed in this Rollator. Very good item. Yes, it's a combination walker & wheelchair. Does this walker foldup to place in car trunk? BEST ANSWER: Yes It does and is very easy to handle and very comfortable to use. This Rolla or has a lock know that you pull and then it folds. Does this chair fold for transportation? does devise come with travel bag? BEST ANSWER: Thank you for your question. It does not come with a travel bag. We hope this information will be of help to you. What material are the casters made of? I don't see "tires" or any tread in the photo. BEST ANSWER: They are hard plastic but seem pretty durable. 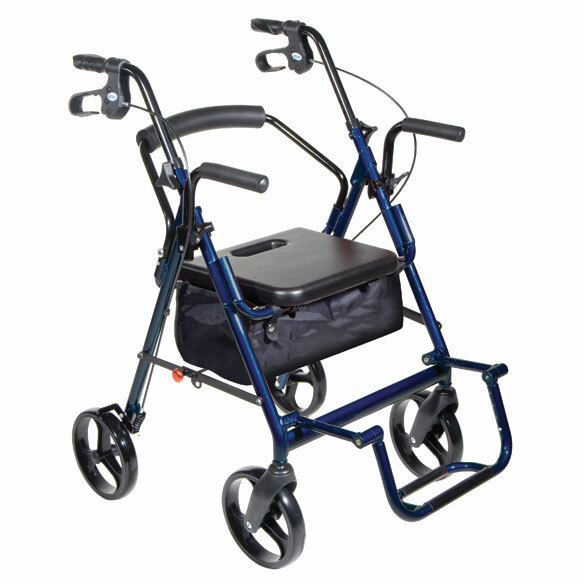 I have used the walker quite a bit on hard surfaces and they have held up well. Thank you for your question. The are made of heavy duty plastic. We hope this information will be of help to you. Can the brakes be locked so the chair will not roll when sitting? Thank you for your question. It does not come with a locking break for while sitting in place. We hope this information will be of help to you. Can chair be fastened closed when folded for storage or checking as luggage on airline? BEST ANSWER: Yes, there is a knob on the side that you pull out and the wheels close together. It fits in my suv perfectly and not hard to put back out -just pull knob and push down, it will lock when correct. It can be folded but would need something to keep it closed tight for storage or travel. how does it travel on airplane? what is the weight limit on this? BEST ANSWER: Thank you for your question. The weight limit is 300 pounds. We hope this information will be of help to you. 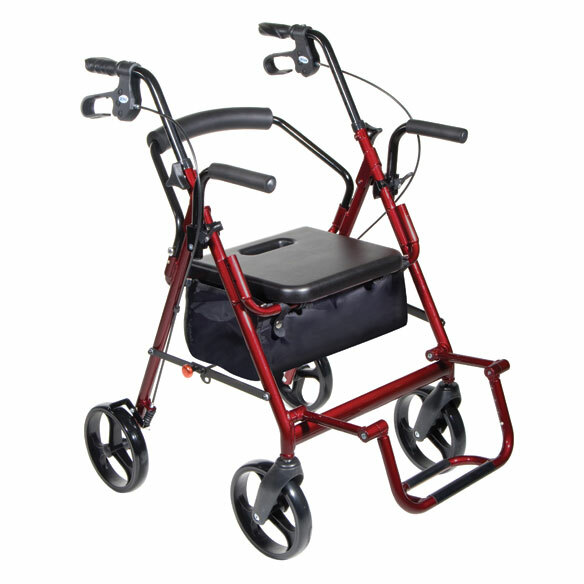 How do I get parts for a rollator in 1, transport chair? BEST ANSWER: Thank you for your question.We unfortunately do not sell parts for rollators. We apologize for any inconvenience. Who is the manufacture of this product? I have no interest in calling or contacting the manufacture, I would just like to know who the manufacture is. I have no interest or need to contact the manufacture, I just would like to know who the manufacture is. WHat is the weight restrictions on this? BEST ANSWER: Thank you for your question. There is a 300 lb weight limit on this item. We hope this information will be of help to you.